Ten years of yearbooks from Charles H. Darden High School in Wilson, NC are now available on DigitalNC. Covering the time period between 1948 and 1969, the yearbooks show life at the African-American high school before it was converted to a middle school in 1970 following integration of schools in Wilson County. The yearbooks are available courtesy of Wilson County Public Library. To view more yearbooks on DigitalNC, visit our North Carolina Yearbooks collection. Here on our blog, we occasionally feature “matchups” that showcase relationships between different items in our collection. Today’s matchup? 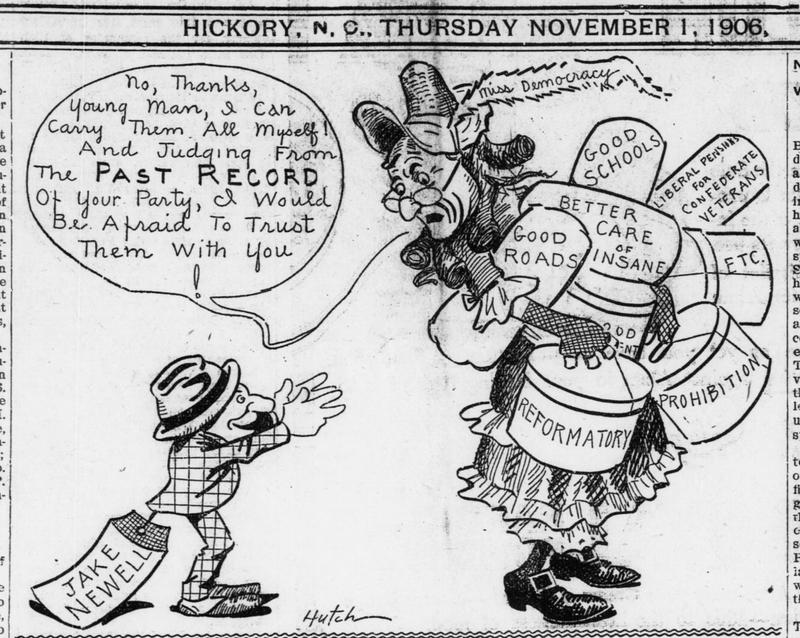 Cartoons from the Hickory Democrat and information from Charlotte City Directories. 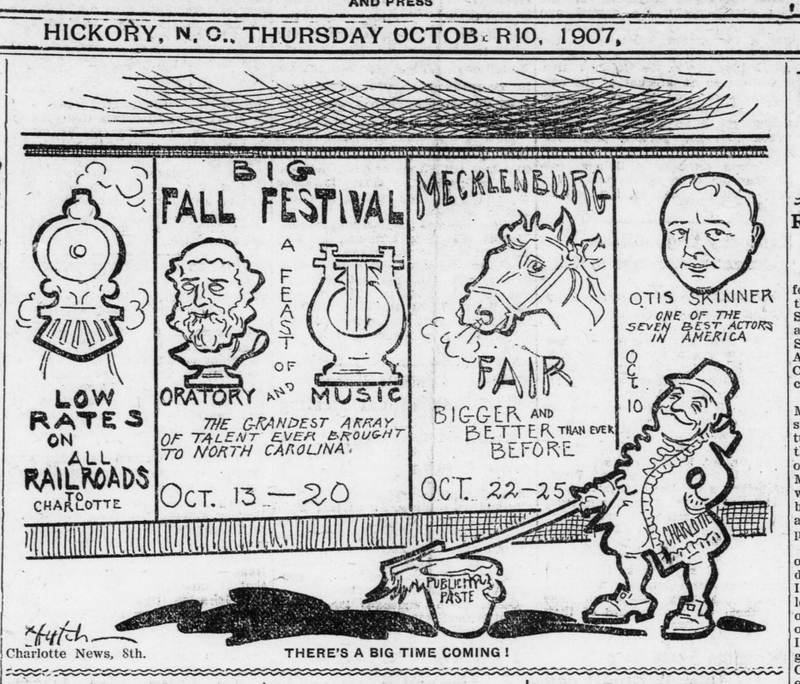 All of these are from the front pages of the Hickory Democrat, available through DigitalNC. 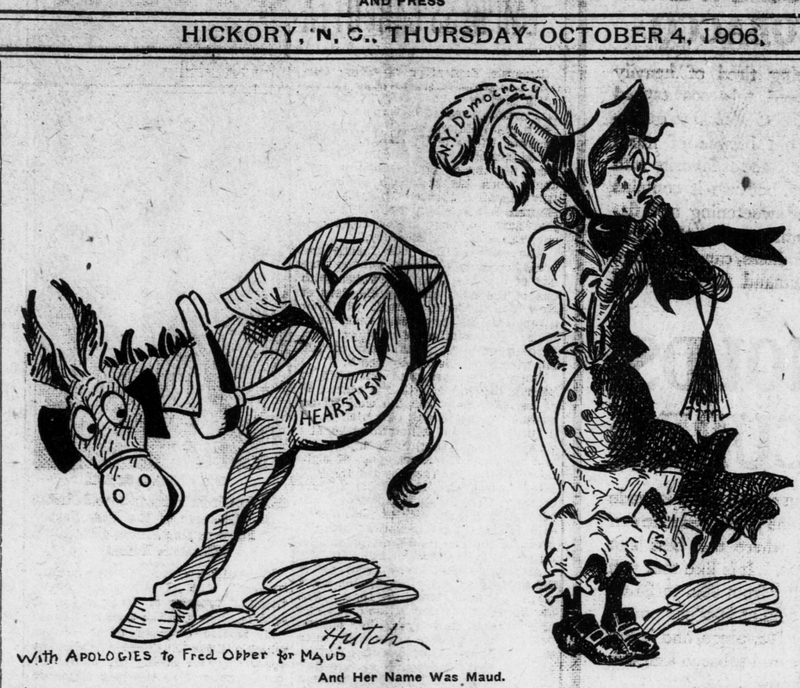 The usual Googling didn’t turn up much, and we couldn’t find any reference to Hutch in the Hickory Democrat besides the cartoons, so we turned to The Charlotte News. From the News, we were able to piece together more about the artist. 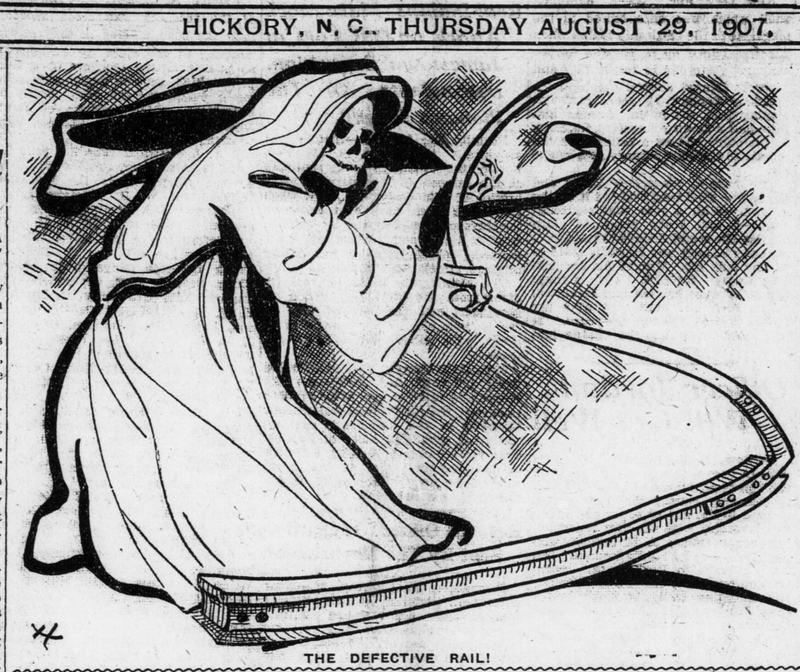 Hutch was the pen name of cartoonist Andrew C. Hutchinson, a Charlotte resident who began drawing cartoons for the News in his late teens. His talent was well respected, especially in light of his age. 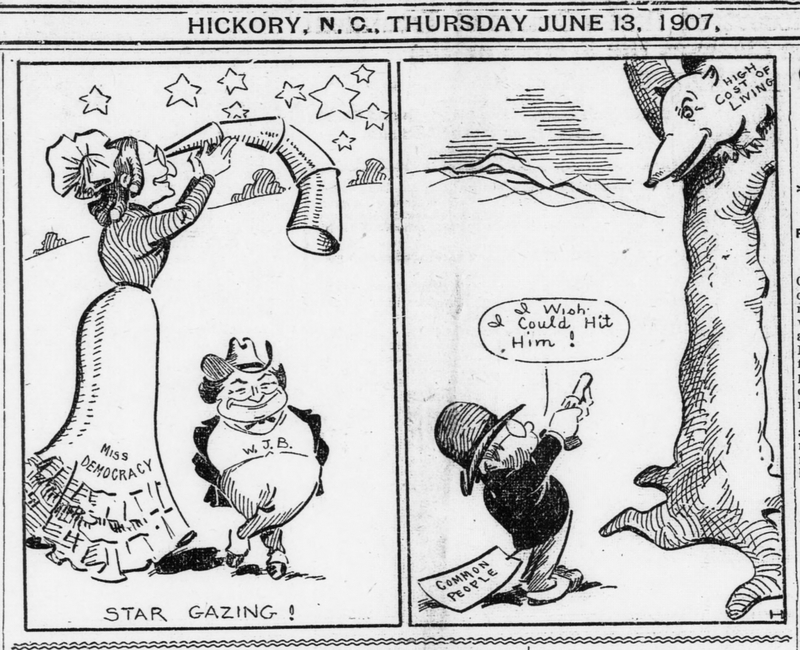 The News occasionally has articles related to Hutch’s career, mentioning that his cartoons were reprinted around the state (as in the Hickory Democrat) and beyond (the Atlanta Journal republished a cartoon in 1909). 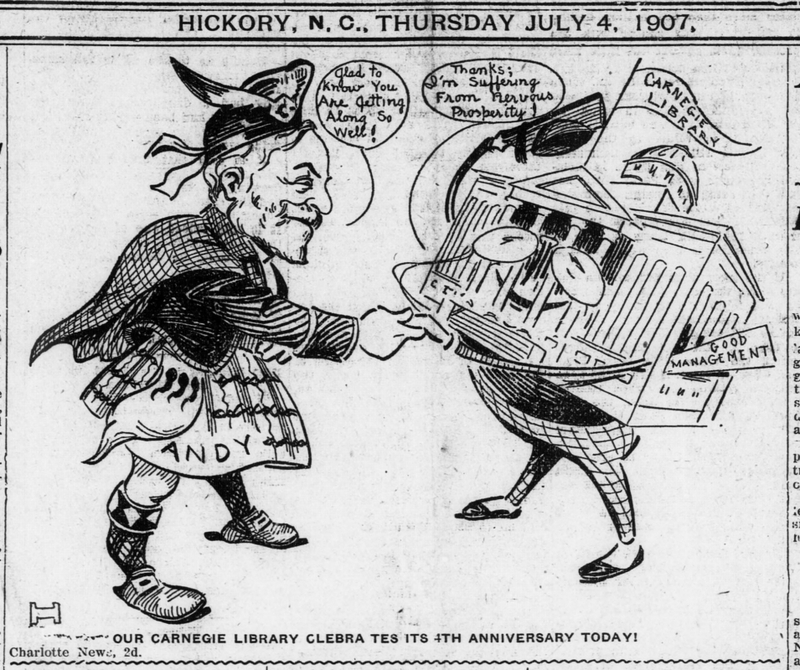 Charlotte News, 1906-05-30, page 1. Available through Newspapers.com. 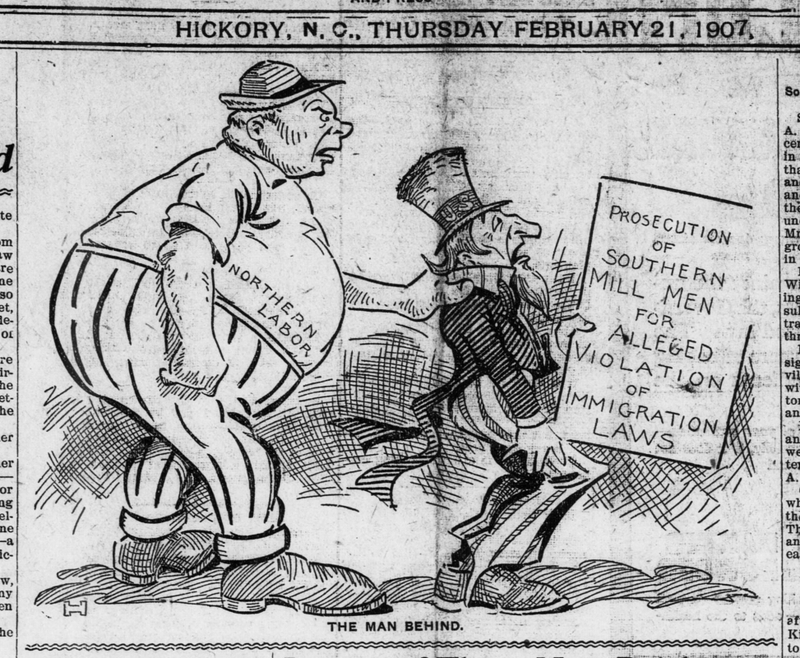 Charlotte News 1915-01-16, page 12. Available through Newspapers.com. Sometime between March 1910 and December 1911, Hutch moved to New York to draw for the New York World. 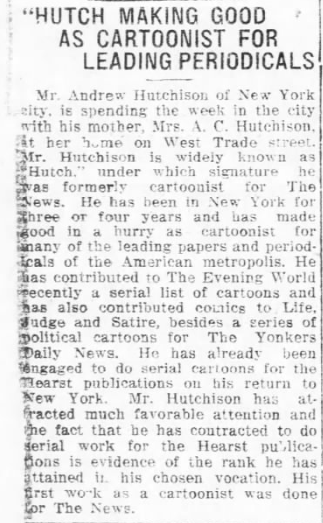 The clipping at right, from the January 16, 1914 News, proudly describes Hutch’s New York career, which was flourishing as he provided content for Life, Judge, Satire, and The Yonkers Daily News, and as he signed on to work for the Hearst Corporation. What else do we know about Hutch? 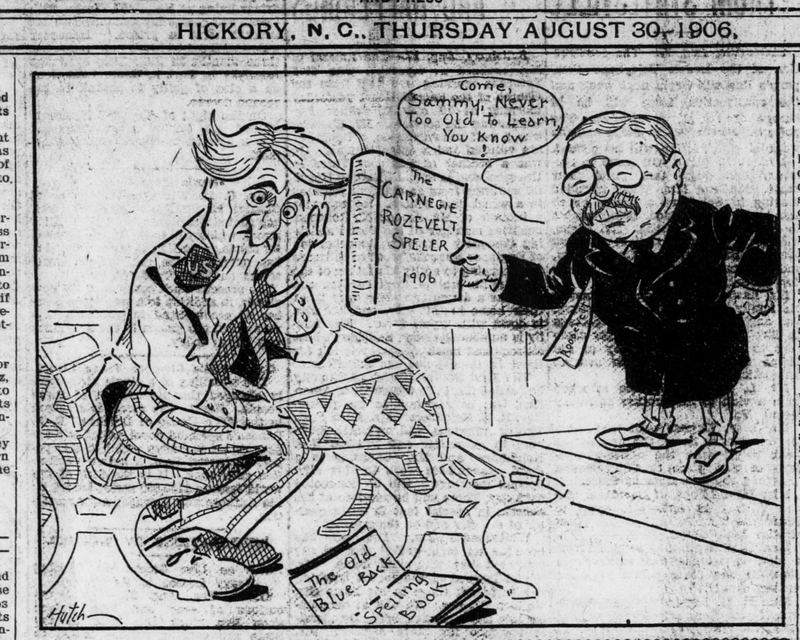 A 1910 Charlotte City Directory lists “Hutchinson, Andrew C. Jr. cartoonist” residing at 711 W. Trade Street. It looks like he’s there with his father and mother*, Andrew and Antoinette Hutchinson, as well as two brothers (James L. and John W.). He isn’t listed in the 1911 directory, which makes sense with his purported move to New York. From that 1911 directory, we unfortunately find out that his father passed away as Antoinette is listed as a widow. This is as far as we got in tracking down Hutch. 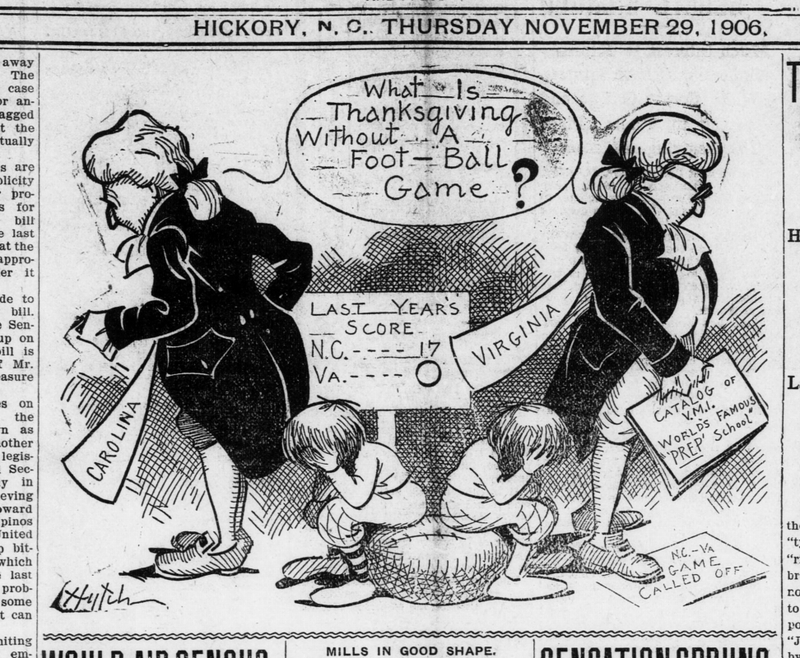 His cartoons don’t appear in the Hickory Democrat past 1907. We don’t know how long he worked in New York, how his career progressed, or where he ended up. If you have any clues, let us know. Elon’s The Pendulum staff publishes their ACC picks in 1991. 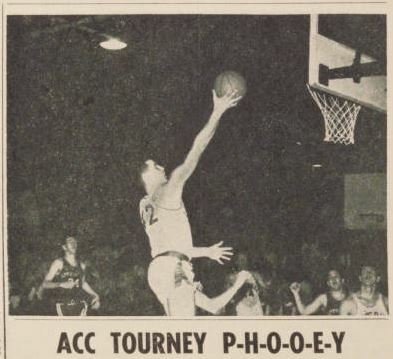 As you scramble to fill out your brackets, we at the North Carolina Digital Heritage Center thought it would be fun to see how the ACC tournament has been discussed across the state throughout the years since the tournament started in the 1950s. While we all know the big names in the tournament who call North Carolina home, many of the state’s smaller institutions have had a lot to say on the tournament over the years as well, even if their own school or anyone from their town is not participating. 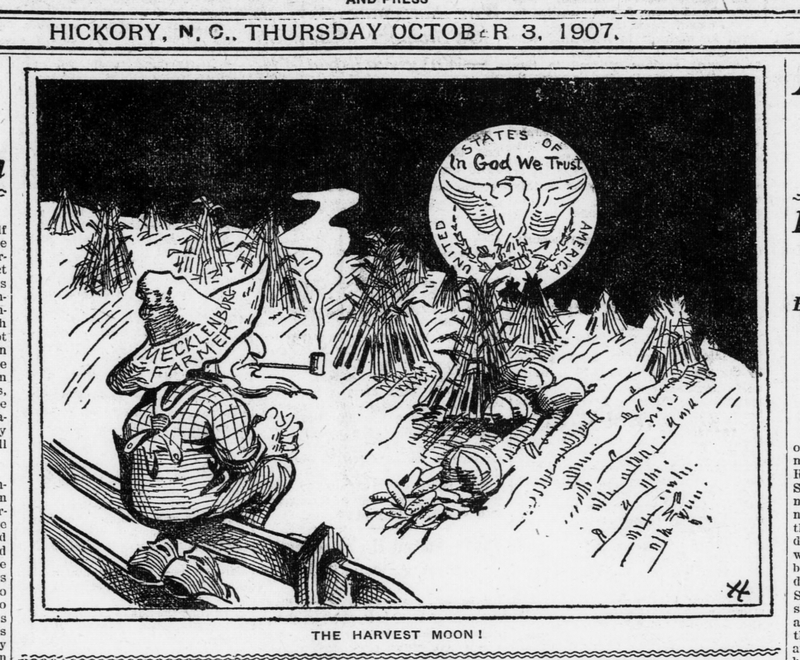 A look through the newspapers we have in DigitalNC shows that North Carolina is truly basketball country, especially in March. 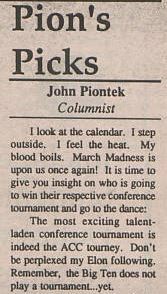 The columnist from the Clarion, Brevard’s student newspaper, in 1979 describing the tournament atmosphere in NC much as one finds it today. 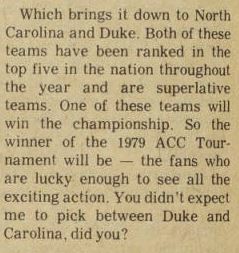 The quote from the article above, from 1979, goes to show that the hyper-attention on the tournament is nothing new. Productivity in North Carolina during this week in March has always been rather low! Elon’s student newspaper sports columnist in 1994 brushes off criticism for focusing on the ACC tournament by noting Elon doesn’t participate in any yet. It seems that all the sports columnists in both town and other institution’s student newspapers had an opinion to offer on who they think will win the tournament that year and overall commentary on the tournament and how it stands up to others for the sport. Many of the columnists remark that having grown up in North Carolina they always followed the tournament, and so brush off any criticism over the fact their own school isn’t participating so why offer commentary? 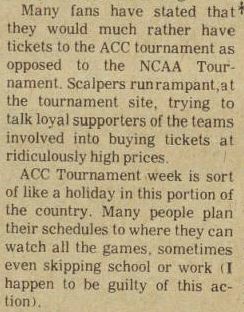 Headline for an article from Louisburg College’s “Columns” student newspaper in 1964, arguing the ACC tournament does not properly reward the best team in the ACC. The other student newspapers across the state don’t tend to pick between the big blue rivalry. This is from the Clarion, Brevard College’s student newspaper, in 1979. Duke and Carolina is the repeated rivalry throughout the sports columns discussing the tournament. There is even a column from Raeford’s The News-Journal that laments that North Carolina State University beat Duke in the first round of the tournament, noting that Duke was clearly the best team in the country. The airlines got in on the ACC fun too. 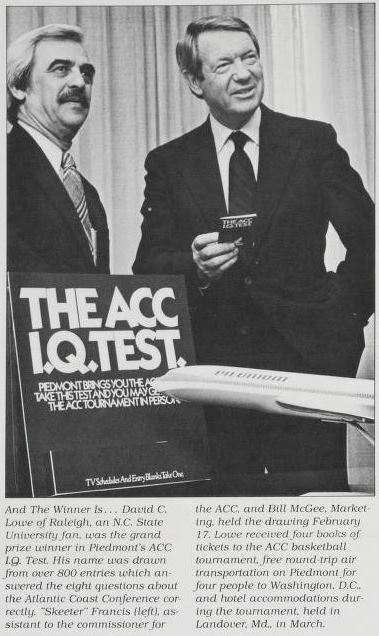 This photograph from Piedmont Airlines’ company paper shows the winner of their ACC trivia contest, with a prize of roundtrip tickets to the tournament in 1981. To view more ACC tournament news from the past and check out more North Carolina newspapers in general, visit the North Carolina Newspapers page. And as the NC Digital Heritage Center staff’s only bias is for all things North Carolina, we wish the Wolfpack, Deacons, Blue Devils, and Tar Heels well this week! 1,000th High School Yearbook added to DigitalNC! A few weeks ago, we passed a very exciting milestone at the North Carolina Digital Heritage Center. We added our 1000th high school yearbook to the North Carolina High School Yearbooks collection. The yearbook that got the special 1,000th honor was the Tar-Bo-Rah issue from 1942, published by Tarboro High School. That particular issue, published during World War II, features a fair amount of patriotic insignia. The cover has the Statue of Liberty on it, the pages features bold blue stars with stripes around Tar-Bo-Rah, and the original owner of the yearbook noted by hand that those whose pictures were not included were already serving the U.S.A. 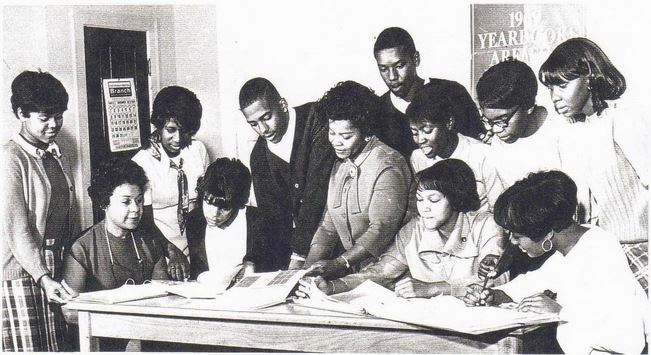 The Tarboro High School yearbooks were made available by the Edgecombe County Memorial Library. To date, 170 different high schools are represented in DigitalNC, coming from 37 counties across North Carolina. The oldest high school yearbook is the 1898-1899 issue of the Whitsett Institute Annual Register. The smallest school represented is Eastern Pines School, whose Souvenir lists only one teacher and twenty students in 1910. To view the over 1,000 high school yearbooks from across North Carolina now available on DigitalNC, visit our North Carolina High School Yearbooks page. If you are a staff member at a public library or other cultural institution in North Carolina that holds NC high school yearbooks in your collection that have not been digitized by the North Carolina Digital Heritage Center, get in touch with us soon and we can talk about how to participate. Honor Roll of Rockingham County, page 46. New items for the Rockingham County Legacy: A Digital Heritage Project exhibit, contributed by the Rockingham County Public Library, are now available on DigitalNC. Of note is the Honor Roll of Rockingham County. 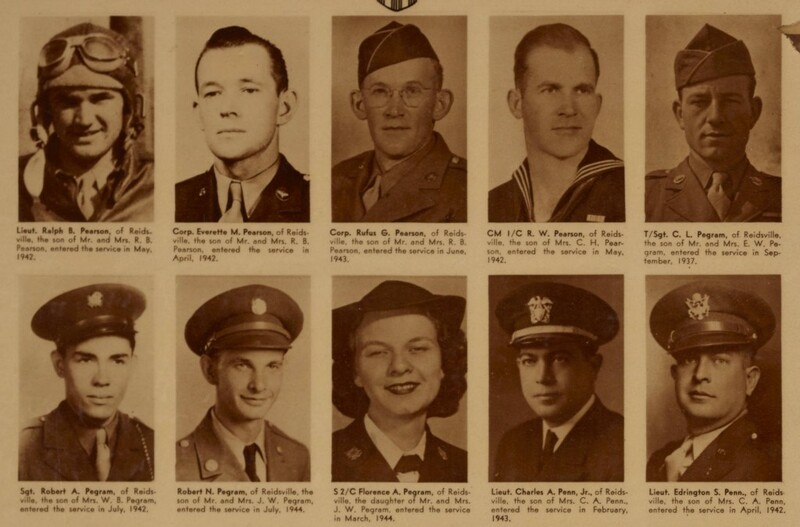 This book is full of portraits of Rockingham county men and women who served during World War II. Beneath each portrait are details including the names of parents, hometown, and service dates. African American servicemen are included separately at the last few pages. Three tax assessment and collections registers for the town of Madison, N.C., from the 1940s and 1950s. We’ve recently digitized and published online a terrific scrapbook from the local history collection at the Wayne County Public Library. 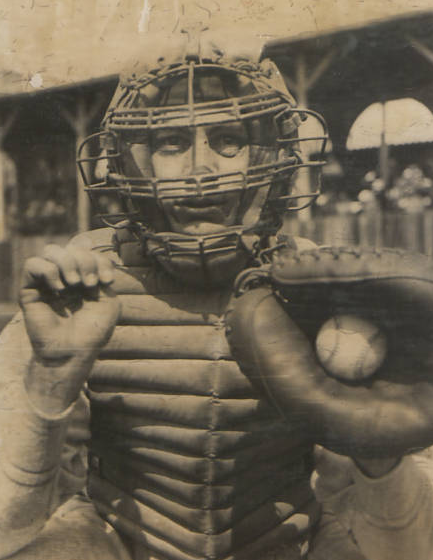 The scrapbook documents the early career of professional baseball player and Wayne County native Johnny Peacock. Peacock was born and grew up in Fremont, N.C., where he excelled in high school sports. He attended the University of North Carolina, playing baseball and football. After graduating from UNC in 1933, Peacock began his professional career in North Carolina with the Wilmington Pirates of the Piedmont League. He continued with minor league teams in Toronto, Nashville, and Minneapolis before making his major league debut with the Boston Red Sox in 1937. Peacock was a backup catcher throughout his career, never appearing in more than 89 games in a season. He spent parts of eight seasons with the Red Sox and a couple of seasons with the Philadelphia Phillies before finishing his career with the Brooklyn Dodgers in 1945. He retired with a career batting average of .262. The scrapbook includes clippings and photographs from Peacock’s baseball career from high school through 1939. We recently digitized yearbooks from the Duke University School of Medicine, spanning years 1950-2013. A few of these in particular stand out and offer insight into the social culture of the era. The 1950 yearbook is bursting with recently married post-war couples and their baby boomer babies, and yearbooks for decades afterwards continue to list spouse and children’s names next to the graduate’s photo. The 1968 yearbook includes a stunning photographic essay chronicling Durham and its community, hospital patients, medical students, and the Duke campus. 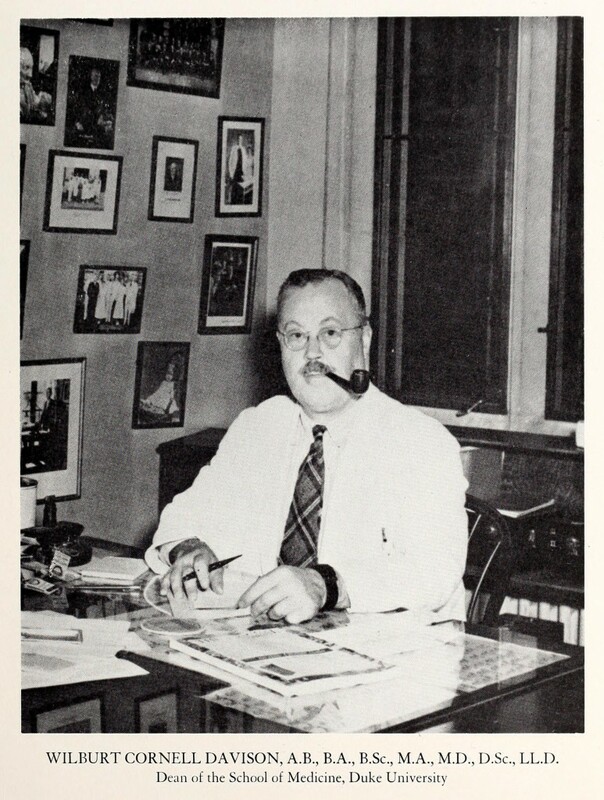 View more yearbooks from the Duke School of Medicine here. These volumes are shared online by the Duke University Medical Center Archives.